Here is this year’s crop of stories (listed in Medical News Today) that I consider to be the most informative, interesting, and likely to change the knowledge base concerning the epidemic of childhood signs and symptoms presently called Autism Spectrum Disorder. Can Children Lose Their Autism Diagnosis? – Uh, yes. And, many more than this group reports. New Gene Variants Linked To Autism Discovered – The perfect storm of environmental toxins and susceptible individuals (genetic variation). Epilepsy Drug Linked To Increased Risk Of Autism – The perfect storm of environmental toxins (medication) and susceptible individuals. Feeding Problems And Nutritional Deficits A Significant Risk For Children With Autism – Ya think? Attention Deficits Picked Up In Babies Who Later Develop Autism – The ‘Spectrum’ diagnosis involves a combination of signs and symptoms, not just the ‘core’ deficits. Help Needed For Youths With Autism Spectrum Disorder Transitioning To Adult Health Care – Transitioning in general, don’t you suppose? Autism Study Finds Behavioral Therapy For Children Can Impact Brain Function – So, the autistic brain can exhibit plasticity. Just like every other human brain. Brain Connections Differ In Kids With Autism – There were lots of brain connection articles this year. The problem is understanding WHY the brains work that way, since it’s pretty obvious that some circuits are crossed and/or missing. Study By Kennedy Krieger’s Center For Autism And Related Disorders Reveals Key Predictors Of Speech Gains – This is why it’s so important for kids to play with others. Suicide Ideation And Attempts A Greater Risk For Autistic Children – Why doctors shouldn’t put teenage patients on anti-psychotic medications. Old Drug Offers Hope For New Autism Treatment – This article covers it all; inflammation, immunity, the environment, mitochondria, stress and recoverability. It’s just in a mouse model, but offers a unifying theory. Gaze Shifting Delay Has Potential To Diagnose Autism At 7 Months – Plenty of research about earliest diagnosis, not much about how to intervene. Multiple Vaccines Not Linked To Autism Risk, CDC – So they keep telling us. Link Between Autism And Increased Genetic Change In Regions Of Genome Instability – The perfect storm… you get it. Minocycline Show Benefits In Children With Inherited Cause Of Intellectual Disability And Autism – Some assistance for patients with Fragile X syndrome, one of the known causes of ASD. Study Shows Different Brains Have Similar Responses To Music – Love of music is universal. Propranolol Could Improve Working Memory In Autism – Several of the older blood pressure medicines perform in some fashion to help affected individuals. Taking Valproate While Pregnant Raises Autism Risk – Drugs taken during pregnancy may not be good for the developing brain. Well, at least it’s in print now. A Newborn’s Placenta Can Predict Risk For Autism – Now, there’s an early predictor! Again, what to do about it? Significant First Step In The Design Of A Multivalent Vaccine Against Several Autism-Related Gut Bacteria – Formal recognition that there is a gut-brain connection in autism. Researchers Successfully Treat Autism In Infant – OK, so maybe you can do something about the earliest red flags. Early Intervention Program For Children With Autism Found To Be Cost Effective Through School Years – More documentation such as this is needed so that governments, insurance companies, and the like will take notice. Link Between Epilepsy And Autism Found – The literature reports that 40% – 80% of patients have seizures (much lower at The Child Development Center, however). A Third Of Autism Cases Also Have ADHD Symptoms – It’s not ALSO, it’s an integral part of the picture for some children. Autism Discovery Offers Hope For Early Blood Test And Therapeutic Options – One of the reasons that I prescribe tryptophan (5-HTP) to address some ASD signs and symptoms. Racial And Ethnic Disparities Found In Gastroenterology, Psychiatry Or Psychology Care For Children With Autism – Yeah, professionals need to get on the same page. Air Pollution Raises Autism Risk – The environment. Again. Single Mutation Can Destroy Critical ‘Window’ Of Early Brain Development – Genes. Again. Autism In Children Affects Not Only Social Abilities, But Also A Broad Range Of Sensory And Motor Skills – Recognition of signs and symptoms that every parent of an ASD child observes. More such information was published subsequently. The Gut May Offer Clues About Autism – By now, even pediatric gastroenterologists should be getting the message. 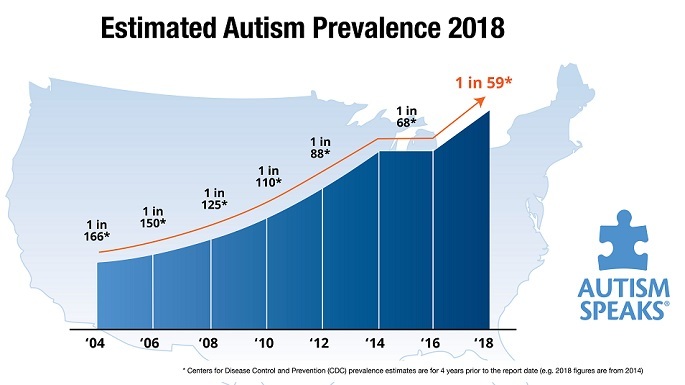 Autism Training Program For Pediatricians Meets ‘Critical Need’ For Earlier Identification – Until now, I don’t think that my fellow pediatricians are doing such a great job at early diagnosis. First Full Genome Sequencing For Autism Released By Autism Speaks Collaborative – This kind of valuable information is why all of the parties in the autism community should work together, rather than criticize each other in public forums. Early Intervention Benefits Young Children With Autism Regardless Of High-Quality Treatment Model – So, if early intervention helps, and we can make the diagnosis earlier, then the situation should be improving. Right? Oxytocin not found to offer symptom relief in autism – A bunch of these articles this year, both pro and con. My experience is that it does help in a small percentage of affected individuals. Fresh fuel reignites Asperger’s debate – Combining two conditions that we don’t understand – couldn’t that make us twice as ignorant? Oxytocin, the ‘love hormone’ may have relevance in autism – This was one of the ‘pro’ articles. New research sheds light on previously under-researched area of study – females with autism – We really need more information about the difference between boys and girls with ASD. Induced labor linked to higher autism risk – Here is my advice (as a Board-Certified Neonatologist): Have the baby when the time comes. Sometimes, Mother Nature does know best. Risk of autism in further children – study findings – This is the type of information that prospective parents frequently seek, and little is really known. Young adults on the autism spectrum face tough prospects for jobs and independent living – This highlights why early diagnosis and intervention are so vital. Genetic disorder 22q could be misdiagnosed as autism – Or, this could be just one of the causes of autism. No? Improving understanding of brain anatomy and language in young children – This is the type of knowledge that needs to be elucidated as we try to solve this puzzle. New cases of autism in UK have levelled off after five-fold surge during 1990s – Well, good for England (if it’s true). This is not the case in the U.S., or most other countries, however. Autistic children look less friendly to peers – And, vice-versa, I would say. Web-based autism intervention tool shows promise – Lots of tech stuff for autism appeared this year. I still like Proloquo2Go the most. Link examined between pregnancy weight gain and autism spectrum disorders – An even EARLIER diagnosis. How about a fetal Speech and Language therapist? Health-care changes needed to help adults with developmental disabilities – Much more information needs to become available to address the growing numbers of older individuals with autism. Autism increases risk for synaesthesia – Maybe shedding some light on the sensory issues in ASD. Relationship between bedroom media access and sleep problems among boys with autism – As if parents didn’t know this! Well, it’s official, now. Gender differences in gene expression in male and female brains – I’ve described this clinical difference before. There’s the “girl kind”, and the “boy kind”. Autistic children’s ability to perform everyday tasks improved by occupational therapy – This one should help with insurance reimbursement. Genes and air pollution combine to increase autism risk – Circling back… genes and the environment. Brain function in children with autism improved by a single spray of oxytocin – It works. It doesn’t work. Which is it? Autism-like behaviors in mice alleviated by probiotic therapy – Human probiotics, by the way. Research linking autism symptoms to gut microbes called ‘groundbreaking’ – Well, it’s important, but groundbreaking? This association has been ‘documented’ since the “Refrigerator Mom” days. Hospital infection in pregnancy tied to higher risk of autism – Perhaps it’s the antibiotics that are given, not the infection itself? Hopefully, 2014 will bring more in-depth research with targeted treatments, so parents will have an increased number useful protocols to assist their developmentally challenged children. This entry was posted on Sunday, December 29th, 2013 at 12:14 pm	and is filed under >ALL<, AD/HD, Alternative and Complementary Medicine for ASD, Autism Therapies, Earliest Red Flags, Gastrointestinal Issue, News-Maybe-Worthy, Reversing autism, Speech and Language. You can follow any responses to this entry through the RSS 2.0 feed. You can leave a response, or trackback from your own site.